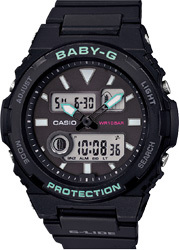 These new analog-digital additions to the BABY-G G-LIDE sports lineup with Tide Graph capabilities go great with surfing and other casual styles. 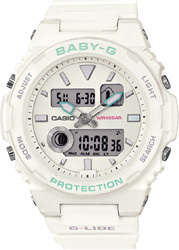 Unique thin-case designs are created based on the G-SHOCK like form of the 90s for a nostalgic retro look. There are three color combinations from which to choose: a mint green model that fits right in at the beach, plus a black and white model, both of which feature mint green accents. These models always provide tide information, even while in the Timekeeping Mode. Each press of the button at 4 o'clock jumps ahead one hour to let you check future tide conditions. The index is designed to enhance readability. 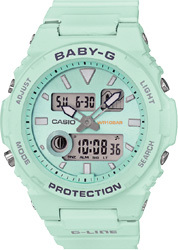 These new BABY-G models are designed to coordinate well with casual and summer beach wear.